Tube bird feeders typically cater to small birds, but can accommodate birds as big as jays or woodpeckers. Some tube feeders allow you to attach or remove perches and/or feeding trays. Depending upon the configuration, you can attract a wide variety of birds or very limited species. Some tube feeders even have feeding ports that only accommodate black oil sunflower seed or thistle (aka Njyer) seed for finches. Below are some of the best tube bird feeders we could find including several by Brome. 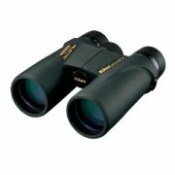 If you have trouble with squirrels, then we highly recommend any of their Squirrel Buster models. 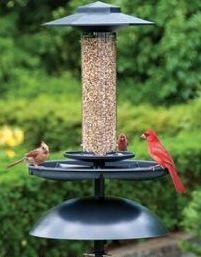 If you are looking for something that's durable, but inexpensive, the Perky-Pet Panorama Birdfeeder is one of birder's favorites. 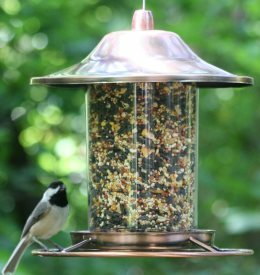 This feeder has a good design that's easy to take apart and clean, and will keep the bird seed dry in rainy weather. View the Perky-Pet Panorama Birdfeeder. 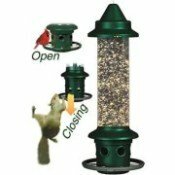 We recommend getting tube bird feeders that are easy to clean, have multiple ports and are squirrel proof. Tube bird feeders will attract goldfinches, chickadees, titmice, small woodpeckers and a host of other common backyard bird species. Just remember to keep them clean. Clean the tubes with warm water and mild detergent when it's time to refill with seed. 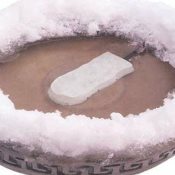 Make sure to rinse thoroughly to remove any soap residue. Wild Bird Food - Learn about the different types of bird seed. Tube Bird Feeder Plans - Plans to make your own tube feeder. Sometimes it's fun to do it yourself if you have the time, tools and patience.